A Bakersfield family says they were discriminated against by a UPS driver. Their neighbor e-mailed 17 News after he says the driver wrote a derogatory term on a tracking slip while dropping off a package. Anant Singh says his father is a member of the Sikh religion and wears a turban. When his father signed for a UPS package last week, the driver asked for his signature as usual, the younger Singh said. But the family calls what they found on the tracking slip days later both hurtful and upsetting. 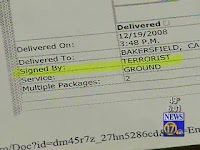 “I just happened to see it said signed by the word "terrorist." So I was amazed. I printed the paper and read it again, and it said signed by a "terrorist," Singh explained. The Turkish physical trainer of Steaua Bucharest has protested to FIFA after he was fired because he's a Muslim. Steaua owner Gigi Becali fired Yuksel Yesilova on Saturday saying he brought back luck to Steaua because of his religion. Becali said: "Steaua is a Christian team and we had bad luck because of him. I don't want to see him here. We can't keep a Muslim in a team that has a cross on its team bus and shirts." Yesilova said Friday he had been called by FIFA officials about his firing. His contract expired in 2010. AN under-age football club is expected to lodge an official complaint with the FAI after a 12-year-old Sikh boy was ordered to remove his turban during a game. Karpreet Singh had worn his turban during matches without incident for four years before a problem arose during a recent schoolboy game in Co Meath. The youngster was told by the referee to remove the 'headgear' during the first half, and didn't return to the pitch for the second. "The referee told him to remove the 'headgear'. The boy said that he couldn't expose his hair, and his teammates rallied around him." A Douglasville woman was jailed Tuesday after a judge found her in contempt of court for refusing to remove her hijab, the head covering worn by Muslim women. Lisa Valentine, also known by her Islamic name, Miedah, 40, was arrested at the Douglasville Municipal Court for violating a court policy of no headgear, said Chris Womack, deputy chief of operations for the Douglasville Police Department. She was taken before Judge Keith Rollins, who ordered her held in jail for 10 days. However, her husband said she was released Tuesday evening. The reason for her release wasn’t immediately clear. Last week, the same judge apparently threw out another Muslim woman from his courtroom. Sabreen Abdul Rahman, 55, said she had gone to court with her son when she was asked to take off her scarf. “I can’t. I’m Muslim,” she mouthed silently to the bailiff, who then removed her from the courtroom, Rahman said. A Sikh rights group asked a U.N. human rights committee on Monday to declare that France violated a student's rights by expelling him for wearing a turban and to recommend repealing the law that led to it. France passed a law in 2004 banning children in state primary and secondary schools from wearing conspicuous religious symbols, including Muslim headscarves, Jewish yarmulkes, large Christian crosses and Sikh turbans. Bikramjit Singh was 18 when he was expelled from school in France in 2004 for refusing to remove his turban, according to a group called United Sikhs, which held a civil rights Conference in New York near the United Nations on Monday. their religious beliefs, the state’s highest court ruled today. Rastafarian who worked as technician at a Hadley Jiffy Lube owned by F.L. written by Justice Roderick Ireland. The European Court of Human Rights has dismissed a complaint by two French Muslim girls that their school violated their freedom of religion and their right to an education. The girls were expelled after repeatedly refusing to remove their headscarves for physical education classes. The teacher had said that wearing a headscarf was incompatible with physical education classes. The girls, Belgin Dogru and Esma-Nur Kervanci, are French nationals and were 11 and 12 respectively when they were expelled from the school in the north-western town of Flers in 1999. Based in Strasbourg, the European Court of Human Rights ruled on Thursday, Dec. 4 that the school's move to expel the girls was not out of line, emphasizing that the girls had been able to continue their education via correspondence classes. A northwest Harris County family said they were treated like criminals after their home was burglarized, KPRC Local 2 reported Thursday. On the night before Thanksgiving, Raman Deep Sinth said thieves broke into his family's bathroom window and ransacked his home. He said about $15,000 worth of stuff was stolen. Sinth said he called the Harris County Sheriff's Office for help. "That night we were actually robbed twice," Sinth said. "Once by the actual burglars, who we don't know who they were, and secondly by the sheriff's department, who we knew who they were." He said he believes the deputies were troubled by his turban. He wears it as a member of the Sikh faith. He said he also believes the deputies were also afraid of his sister's kirpan, another religious symbol. Sinth said soon, he, his sister, mother and another relative were in handcuffs. He said he was locked up in the back of a sheriff's cruiser. Saleca Faisal-Parkar, 31, was harassed, overlooked for jobs and training and was even branded "lazy" after she became seriously ill while pregnant. The abuse was led by Stephen Jones, then head of litigation at the leading law firm Shakespeares, who also referred to her as a "flipping nun". He was also a deputy district judge and a member of the Solicitors Disciplinary Panel, but has resigned both positions in the light of the scandal. Mrs Faisal-Parkar, who has a young daughter, joined Shakespeares in 2002 as a legal assistant. Not long after she started, she found out from a fellow worker that she had been nicknamed "Mother Teresa" because she wore a hijab, which covers her head. Over the course of the following months, she said Mr Jones - who made the derogatory comments in emails - harassed her, refused her training requests and potentially reduced her annual salary increase by the type of work he gave her. A Halifax County man was turned away from a local mission when he refused to remove his turban while trying to make a donation. Gary Khera, who is a Sikh with U.S. and Indian citizenship, went to the Union Mission this week to donate cash or food, The Daily Herald of Roanoke Rapids reported Thursday. Khera said he had previously mailed in his donations but wanted to visit the site in person. The mission has a rule - explained in large lettering on the mission's door - asking all males to removed headcoverings inside the facility, and mission directors asked him to remove the turban. Khera refused to do so because he wears it all day as part of his religion. We are pleased to announce that Morgan Hargrave has joined DNSI as a research intern. A native Texan, Morgan has lived, worked, and conducted research in Argentina, Washington DC, and Jerusalem over the past few years. His work has been largely focused on inequality, public policy, and international affairs. Morgan currently lives in Austin, Texas, where he helps coordinate disaster recovery operations in the wake of Hurricane Ike. Morgan graduated from Texas Tech University with a major in International Business and a minor in Spanish. He has been continuously involved in community service projects and is interested in how societies react during times of conflict and social change. We are lucky to have him on board!